Hachinohe and Misawa are two airbases located a few miles apart, roughly 300 miles north of Tokyo in Aomori prefecture in Japan. Every September they conveniently schedule their Open Houses on consecutive days providing a great opportunity to visit two airshows in one weekend. Mike Leonard has written a two-part review of this Japanese double header. 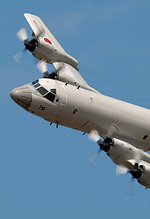 The airbase at Hachinohe is a joint Japanese Marine and Ground Self Defence Force station, home to 2 Kokutai (2 Squadron) operating the venerable Lockheed P-3 Orion (a second Orion squadron was also based at Hachinohe until it disbanded a few years ago). In the past the squadron carried colourful tail markings but currently the only squadron insignia the Orions currently carry is a small unit number "2" on the tail. 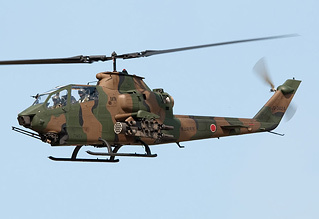 Also based at Hachinohe is the Northern Army Aviation Group which operate from a separate area on the base with a dedicated short runway for their helicopters. In November the Army hold their own Open House in their part of the base. Hachinohe is a low-key Open House, and all the more enjoyable for it, without the crowds of some of the larger Japanese shows. As as result it's possible to causally wander around the static and watch the displays without worrying about not being able to get a good viewing spot on the crowdline. One reason for this is the fact that the popular Blue Impulse national display team do not attend this event. 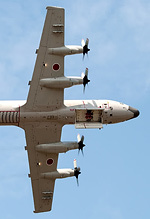 As at most Open House events in Japan the flying and static display are focused on the based types and Hachinohe's specialty is the P-3. 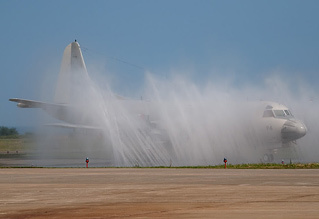 There are many display flights by the based Orions; you will see Orions, taxying, flying clean, with flaps and undercarriage down, Orions being washed, dropping buoys, flying with an engine shut down, topside and overhead passes. In fact there is so much Orion activity during the day you may start to hear their distinctive engine noise in your sleep. Another part of the flying display is an impressive demonstration by one of the based Army helicopters, this year being the turn of an AH-1 which, amongst other tricks, simulated strafing the crowd with its nose cannons. The static usually features a mix of Marine Self Defence Force types such as YS-11 and UH-60 as well as a number of fighter types, including a JASDF F-15 from one of the more elusive Hokkaido based squadrons, a F-18 of the US Marines, or Misawa-based WW coded F-16s and their Japanese equivalent Mitsubishi F-2, which this year came from 3 Hikotai, displaying a special "Samurai" marked example. One of the highlights of the Hachinohe Open House is at the end of the day when the visiting aircraft depart. The static display area is first cleared, the crowds pushed back to one side of the ramp and the visiting aircraft are prepared for departure one after another - all directly in front of the crowd. Dispite clear blue skies for most of the day, this years Open House was interrupted as the visiting aircraft started to depart by dark clouds and sudden heavy rain, forcing some aircraft to delay their departure and most people running for cover, unfortunately bringing this year's Hachinohe Open House to a sudden and damp end!